Banned Books Week: Sept. 25-Oct. 1 | Back to Basics Learning Dynamics, Inc. 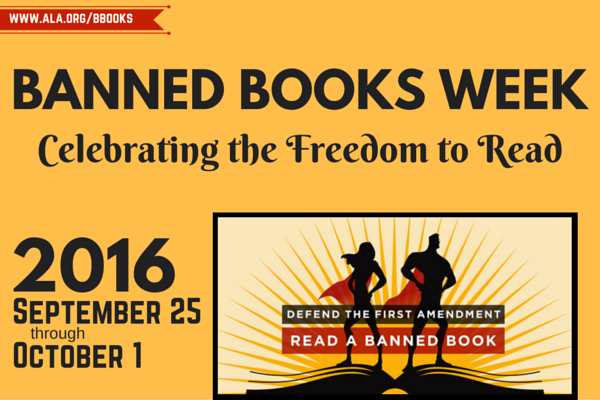 Banned Books Week, September 25 – October 1, 2016, is an annual celebration of the freedom to read. Since 1982, librarians, booksellers, teachers and countless others take this opportunity to highlight the importance of intellectual freedom and remind us not to take this precious democratic freedom for granted. Banned Books Week also highlights the benefits of free and open access to information while drawing attention to the harms of censorship by spotlighting actual or attempted bannings of books across the United States. Banned Books Week is sponsored by the American Booksellers Association;American Booksellers Foundation for Free Expression; the American Library Association; American Society of Journalists and Authors; Association of American Publishers; and the National Association of College Stores. It is endorsed by the Center for the Book in the Library of Congress. In 2011, the Comic Book Legal Defense Fund; National Coalition Against Censorship; National Council of Teachers of English; and PEN American Center also signed on as sponsors. Here are ten surprising books that have been banned or challenged over the years. How many have you read? For more information, please visit the ALA.
An investment in education is an investment in the future. Since 1985, Back to Basics Learning Dynamics has been the undisputed leader in 1-on-1 tutoring in Delaware and southeastern Pennsylvania for over 60 subjects for children and adults, including 1-on-1 SAT/ACT/Praxis Prep, as well as translating and interpreting in 21 languages, homebound services, RTI support, and psycho-educational testing. For more information about Back to Basics’ educational services, please call us at 302-594-0754.